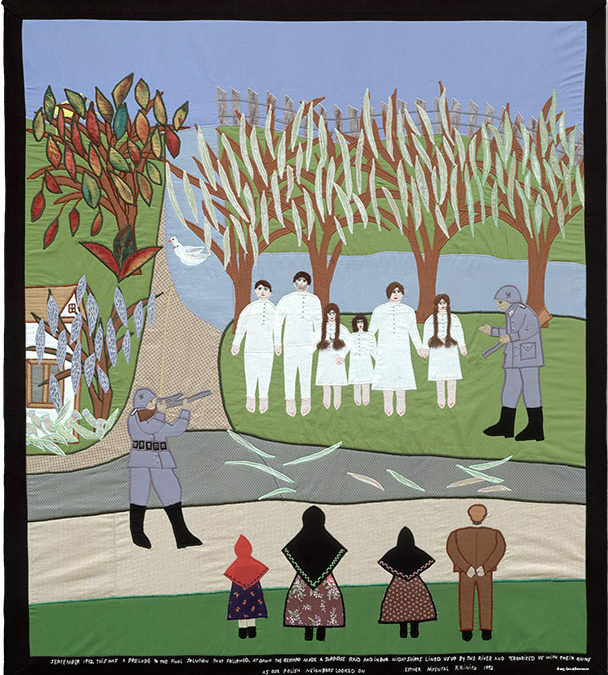 A harrowing tale of loss and survival is told through vivid textile works of art drawing viewers into a stark reality while revealing the strength found in memory and creative expression. Esther Nisenthal Krinitz was 15 when she defied Nazi orders, separating from her family, as they reported to a nearby train station with the other Jewish of their Polish village. Making their way to a village where they were unknown, Esther and her younger sister survived the war by posing as farm girls. They never saw their family again. Nearly four decades later, determined to show her daughters the family she had lost, Esther turned to needle and thread to create a series of 36 hauntingly beautiful, exquisitely detailed works of fabric collage and embroidery – a legacy born of love, loss, and a the sheer force of memory.